On this week’s episode of Real World IoT, host Ken Briodagh discusses water conservation through IoT with Co-Founder and President of Waterbit, Manu Pillai. On this week’s episode of the Real World IoT Podcast, Ken Briodagh sits down to speak with Bruce Chatterley, President and CEO at Senet. Bruce has more than 25 years of experience building successful high growth technology businesses. He most recently operated as an Independent Growth Consultant to global fiber optic telecommunications providers, based in London UK. Chatterley is also an experienced telecom leader, serving as CEO of cloud-based VOIP firms Broadvox and Speakeasy. In addition, he is a former senior executive at Ameritech and US West. Chatterley has also been an early leader in the development of the Software As A Service industry, having served as CEO of ViAir and President of eServices for Concur Technologies. Earlier in his career Chatterley also held Senior Sales and Marketing positions at GE and IBM. He earned his BSBA from Central Michigan University and his MBA from the Kogod College of Business Administration at American University. He currently serves as a Board member for London-based technology firm Snupps, Inc., Bigleaf Networks, and Clevest. On this week’s episode of Real World IoT, our host Ken Briodagh speaks with Robin Duke-Woolley about eSIM technology. Robin is the CEO of Beecham Research and has been in the telecommunications business for the last 40 years. Starting off in industry, he then moved onto analysis and consulting and has now been working in M2M and IoT since 2001. Robin more recently created Beecham Research which is a market research and consulting firm that focuses entirely on IoT and M2M. Danny Royer is the Vice President of Technology at Bowles Farming Company in the middle of California Central Valley. His job is integrating technology into the everyday things that are done on the farm. The farm is about 12,000 acres, producing about 21 different crops and irrigating mainly with subsurface drip irrigation. Currently Bowles Farming Company is in the middle of the planting season with crews planting and processing tomatoes and cotton. The cotton being grown on the farm is unique in the fact that they are using DNA tracing technology to create transparency throughout the supply chain on cotton fibers. Relative to IoT, sensors, modules and controllers are used throughout the farm to manage and maintain the many different facets of the farm. With all of these connected things, the biggest challenge is how to manage all of those connections. On this weeks’ episode of Real World IoT with 151 Advisors, our host Ken Briodagh sits down to talk with Evan Cummack about the current state of the IoT. Evan is the Principal Product Manager for Twilio’s Programmable Wireless product line. He has been with Twilio since 2011, has developed multiple new products and consulted with many of Twilio’s largest customers on global communications solutions. Twilio is a global development platform providing APIs for various forms of communications, catering to customers and developers alike. Christian Solomine has been working in the M2M/IoT industry for about 20 years. Prior to working with IoTM, he directed the North America Global Partner Program at Telefonica Digital, focusing on Machine-to-Machine(M2M)/IoT solutions and helped lead global business development initiatives. Prior to Telefonica, Christian ran M2M worldwide sales for Rogers Communications in Canada and directed sales at Jasper Wireless for their fleet management and consumer electronics practice. When he first started in the space he worked with vehicle tracking systems and sourced connectivity from major cell companies. There wasn’t really a way to track and control the data being used, and at the time it wasn’t a very big deal due to the small amount of devices. As the industry grew, Christian began to see an opportunity for a management service like IoTM to disrupt the marketplace and is now a board advisor for the company. 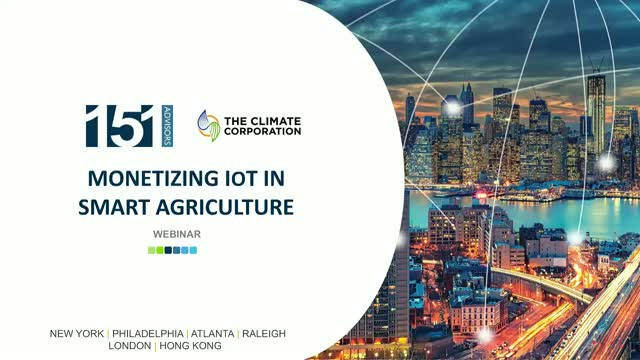 Educating individuals and companies on monetizing the connected world through real-world IoT Use Cases, Deployments, Solutions, Products, and Services. Subscribe to this channel for all things IoT-related from your favorite industry thought leaders! 151 Advisors a leading IoT consulting firm that provides companies across all industries with real-world go-to-market strategy and execution services that monetize the connected world. Our expertise is built on decades of helping enterprises and vendors define, execute, and accelerate their market positions to drive commercial success. Learn more about our team, capabilities, and experience at www.151Advisors.com.